I’m sure we all have an older model TV lying around. You’re probably wondering if Roku works on older TVs. If you’ve done your research you will be happy to find out that it does. What is nice about this is that if you have an older TV with no cable setup, you can use a Roku device for this. The cables for your older TV model comes in the box, so you don’t have to worry about finding the correct cable cords for your device. Here is a video that shows how to set up your Roku device. See how easy it is. It’s pretty simple. You really don’t need much to do to get it started. Cable or satellite services seem much more complicated. That’s why they have these technicians come to your house and spend a few hours setting things up. If you have an older model TV, you’re probably not too fussy about picture quality. I know people want to see what they are watching, I do too. For me, in general, I’m not too picky about the picture quality. As long as there’s no snow or fuzz, I’m pretty happy. You do get pretty good reception with a Roku device using your older model TV. You do need high-speed internet. You can check your internet speed by doing an internet speed test. The number you’re looking for at least 1.2 Mbps or higher. Good internet speed will prevent a lot of buffering you get when you stream your shows or movies. In my opinion the higher the better. I always have a need for speed when it comes to my devices. That’s just me though. You also need a wireless router. 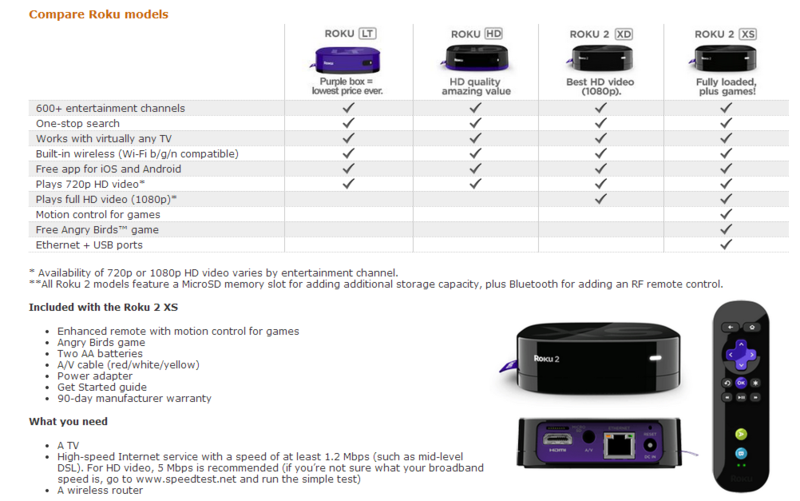 With Roku for older model TV’s they provide the cables, you need to watch your shows or movies. If you’re gonna buy a used one, you want to ask the seller if it comes with the cord. I understand when people purchase used products, sometimes it doesn’t come with everything. It all depends on the device you get. I’ve seen the price run higher for each model and lower. You just gotta shop around. If you’re into the fully loaded device then I recommend Roku 2 XS. If you want to save a little money then Roku HD works well. You can look at the chart and see which one works best for you. It’s nice to know that even with an older TV you still can have the benefits of streaming your favorite shows with a streaming device like Roku. Sometimes we are not ready to give up our older TVs because they work fine. Why fill up the landfills will good working TVs. Making something old into something new can work with a Roku device. If you have any questions or comments about using your older TVs with Roku, let me know below. I have an old TV that now has a cable box and works fine. Looking to get rid of the cable box (stop paying the monthly rental fee) and wondering if Roku 2XD will allow me to still get my cable channels. My TV does not have an HDMI outlet, so realize I have to buy a cable with the 3 colors (red, yellow, white). I already have Prime and NetFlix on other TVs. Thanks for any help you may give. Hey Sharon Roku 2 has the red, yellow and white cords needed for your older TV. If you have any other questions feel free to ask, Evelyn. I have attached a Roku to a VGA monitor using an adapter. The adapter also came with an audio cable. The cable plugs fine into the monitor, but the identical sized other end is too large to fit into the Roku. What am I doing wrong? Hey Tracy, I believe the cables are not for a TV monitor that is probably why the size to too large for your Roku device. The only suggestion I have is that you can try to purchase another adapter. that fits into the audio cables, I do want to warn you if you do that, there is no guarantee that it will work. VGA and TV monitors are a little different. If you do get it to work you are going to need audio speakers as well for sound. I have an older tv do they make a cord with HDMI on one end from roku and white yellow that I can use for going into the tv? I have a roku DX. Hey Preston, You can try an adapter to see if it works, however, Roku DX provides the cords to insert though your older TV. You have to be careful with adapters sometimes they don’t work and it would be a waste to spend money on an adapter that doesn’t work. Your TV mainly has to be compatible with the adapters you use. Your best bet is to use the yellow, red, White cord to your older TV. We are just beginning to explore Roku. Our TV works fine, but it was purchased brand new in the early 90’s and we only use Cat 5 internet. Is it possible to use Roku on a Cat5 or Hard line system? If so can you offer any tips or tricks, or recommendations for which system to buy? Does each tv need its separate Roku? We have way too many for the two,of us but just can’t seem to let them go. Our grandchildren don’t come over as often but still like having a tv when they are here. Great discussions and EASY for me to understand. Thank you so much. I’m trying to Hook Up a Roku to a older TV and can’t seem to get it to work. What am I doing wrong? Thank you for any tips you can give me. If you’re hooking Roku up directly to your television, then maybe you should check the channel that Roku will show up on your TV. It could be channel 3 or 4. Also make sure that you correctly inserted your cords, red and white is usually audio, yellow is usually video. I know trying to get your device set up can be a little frustrating because there are tons of quirks that goes along with setting up devices. If you’re setting it up by plugging your cords to a device such as a DVD player, you may have to turn on your DVD player you would use the same channel as your DVD player should work. I know for me, it’s usually playing around with one audio/video cords and selecting each channel to get it to work. I start with the red cord only, I input the red cord on each outlet until I get results, if I don’t, I change the channel and try again. This usually works for me and this might be a way for you as well. I’m old school and like it that way 🙂 Thank you for putting it down so it was so easy to pick up. I’m in and bout to hit Amazon to get my Roku. Can’t wait to join Netflix and watch #OITNB, along with the rest of the world. That is great Daniel, thanks for the info. I just purchased a Roku 1 and I’m trying to collect it to an 2004 Panasonic triple play tv that works great but the Roku 1 doesn’t take it. Is the Roku 1 the only one for old tvs?? It should work, it’s made to work on older TVs especially if you don’t have an HDMI outlet, I don’t know how techie you are, but you may have to check channels and see where your TV gets the reception with your remote control. Check your input, you may not see HDMI, It might be located in video 1 or something similar like that, make sure your Roku is on. I’m sure you probably did that, lol. Your TV should come with plugin play, that might be an easier rout. I’m not sure if your TV comes with a VCR and DVD already installed, if it doesn’t and your TV is connected to a DVD player, you might want to plugin your video and audio to your DVD player. The way it would work is by you having your TV set to the DVD channel, try changing the channel on your DVD player and see if that works. There are so many variables that I understand it can get quite frustrating. I have a very old Black & White TV that I want to use with Roku 1. The TV has only 2 screws to attach to an antenna wire , no other inputs. I run cable through my VCR/DVD and then to the TV, using a coaxial to antenna transformer. My VCR/DVD only has a single coaxial input and a single output, not composites. I’ve read that you shouldn’t connect Roku to a VCR/DVD anyway. Is there a way to play the Roku on this old TV. I love black & white and do not want color TV. This reply is probably too late but hopefully helps anyone else that has your same concern. While I do not need to use a coaxial to antenna transformer I also use my VCR’s composite inputs as I am out of options…..as in too many gadgets 🙂 Since I am out of composite inputs on the TV itself I ran my Roku 1 through the VCR’s instead (just like I have with PS2’s, PS3’s, etc.) and send it to the TV through an RG-6 coaxial cable. Bottom line is it works beautifully and the same method will also work on an HDMI TV that is out of HDMI connectors. Hey Howard Thanks for your help! I actually have one of these, and it works really well. Simple but effective. We are now in the golden age of entertainment. You can watch whatever you want, whenever you want. I wish I had known about this sooner. I had an older TV stored away but I threw it in the garbage and bought a new one for the bedroom. This Roku looks like a really good and simple device. I will look more into this. Very interesting to know. I have an old TV and I can’t use it. Now I will pull it out of the closet and use it. thanks for sharing this info. I am sure a lot of people like me still have the old TVs and would like to hook them up. Thanks for bringing this information to all of us. I guess I’ve been in Japan too long. I’m not familiar with this streaming stuff. After you pay for that Roku HD, do you have to pay for a service too? Thanks. Once you pay for the box there are no additional fees, unlike cable service providers. You do get some shows for free with Roku. Some of the shows are older shows. If you want the latest shows, you could sign up for a service like Amazon Prime, Netflix or Hulu Plus.Hulu plus and Netflix runs around $9 dollars a month. Roku has a lot of apps to choose from. It just depends on what you like to watch. I recommend you go to Rroku.com/” target=”_blank” rel=”nofollow”>oku.com and look for what you like to watch. If you don’t watch too much too much TV, the free services may be what you’re looking for.